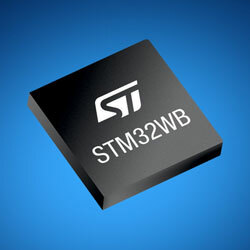 Mouser now offers the STM32WB wireless microcontrollers from STMicroelectronics. Supporting Bluetooth 5.0, ZigBee 3.0, and OpenThread connectivity, the dual-core microcontrollers are perfect for a broad range of IoT applications, including home security products, smart lighting, wearable devices, fitness and medical devices, industrial appliances, and asset tracking. The wireless microcontrollers are based on the company’s low-power STM32L4 microcontroller and provide a rich peripheral set with power-conscious performance. Centred around a 64MHz Arm Cortex-M4 application processor core and an Arm Cortex‐M0+ network processor core, with up to 1MB of on-chip flash and 256KB of SRAM, the devices combine a 2.4GHz radio transmitter optimised for low power consumption and high RF performance. The devices feature multiple power saving modes, including adaptive voltage scaling, 13nA shutdown mode, and an adaptive real-time accelerator to allow zero-wait-state execution from flash memory. The devices provide state-of-the-art security features together with public key authorisation, customer key storage, and an elliptic curve encryption engine. The highly integrated devices also include a crystal-less USB 2.0 Full-Speed device, 32 MHz RF oscillator, analog peripherals, and a Quad-SPI port to connect to external memory. The microcontrollers are supported by the P-NUCLEO-WB55 Nucleo Pack, a comprehensive development kit.